A delightful, whimsical, JAM-tastic adventure! The jam has been sucked out of Sam's doughnuts! Who are the culprits? Sam sets a trap to catch the jam thieves and gets a surprise! 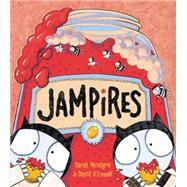 It's the Jampires: friendly little creatures whose love of jam and sweet things gets them into trouble! They fly off with Sam to their magical land sitting in the clouds, where doughnuts grow on trees, jam tarts sprout like flowers, and castles are made of jammy sponge cake. Sarah McIntyre has published several award-winning and best-selling books in the United Kingdom including ORRIS THE MANKIEST MONSTER by Giles Andreae and OLIVER AND THE SEAWIGS. She is crazy about raspberry jam, loves incredible hats and wigs that she often makes herself, and adores making comics with her friends. She lives in London. Visit her online at www.jabberworks.co.uk or follow her on Twitter @jabberworks.